This trail passes through hardwood hammocks and river swamps and past numerous springs. It’s perfect for beginners, because the river has slow current and gentle curves. The 26-mile long trail begins just below River Rise Preserve and ends about three miles upstream of the confluence of the Santa Fe and Suwannee rivers. The Santa Fe forms the entire northern boundary of Gilchrist County. The Suwannee River Wilderness Trail is a canoe and kayak trail managed by the Florida State Park Service that runs for 207 miles of this beautiful and primitive river with many stopover points, some developed and some primitive. The Lower Suwannee portion of the trail runs from Branford, just outside of Gilchrist County to the north, to the mouth of the river at the Town of Suwannee on the Gulf of Mexico. The entire western boundary of Gilchrist County is the Suwannee River and its associated trail. Because of the many boat ramps and canoe launches along the river, you don’t have to follow the entire length of the trail. 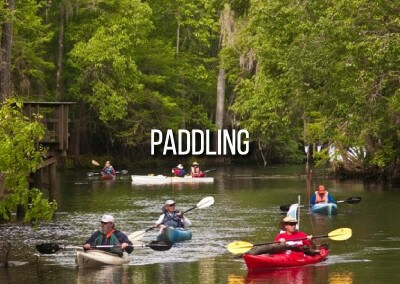 Paddlers can set their own pace and vary the length of their journey to their heart’s content.